Sometimes you may not want e-Campaign to send emails too fast to avoid flooding your mail servers. 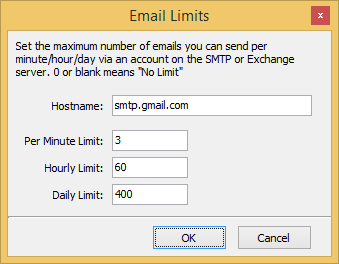 And some mail servers may impose per-minute/hourly/daily quota to your outgoing emails; they will block further emails after reaching your email sending quota. 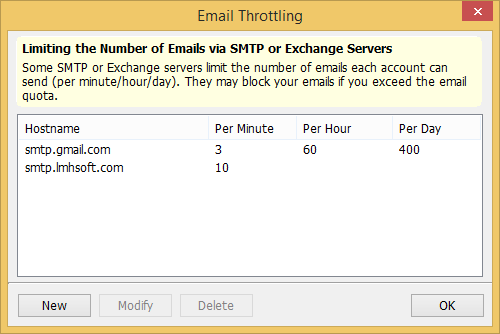 In such situations, you can use the "Email Throttling" feature to set up limits to the email sending speeds. 1. 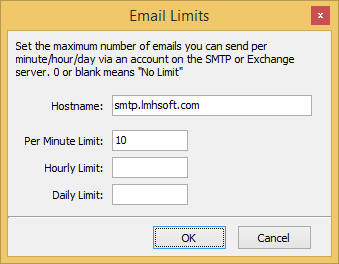 Click menu "Tools -> Email Throttling"
You can configure up to three speed limits for a mail server: per minute, hourly, and/or daily. Bland or 0 indicates "no limit." e-Campaign will pause email sending when whichever limit is reached, and automatically resume sending after all limit conditions become false. The following are some throttling examples. 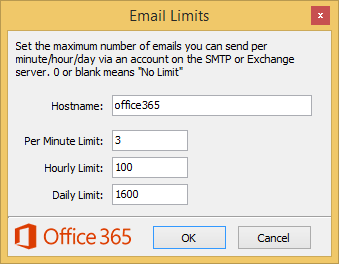 To throttle the email delivery speed via your Office 365 account, please enter the special pseudo-hostname office365 in the Hostname field. To throttle the email delivery speed via your Exchange account, please enter the OWA hostname in the Hostname field.